A warm, creamy chocolate coffee that can be a dessert itself. 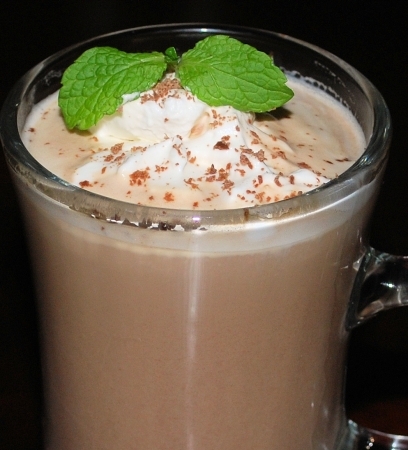 Suisse Mocha provides great flavor – coffee and chocolate combined. Add the Baileys Irish Cream Mint Chocolate and it will be creamier and have that wonderful hint of mint. Ingredient amounts for the beverage will serve one, but the whipped cream garnish will serve 4 – 6. Adjust beverage amounts to accommodate the number of people serving. Place a medium bowl in the freezer for 5 minutes, remove and add cream. Using a mixer beat on high until soft peaks form. Add sugar and vanilla and beat for 1 minute. Do not over beat. Refrigerate while making beverage. Make the Suisse Mocha according to packing directions, substituting the ingredient amounts recommended above. Or adjust according to your taste.